Location: El Despeñadero is located in Toledo Spain offering great partridge shoots. This company also has one of most important hunting teams and the most prestigious hunting scene. About your host at El Despeñadero: Angel Lumbreras, Shoot Captain. With over 20 years working hand-in-hand with Darío Vallano Sr. in all corners of Spain has become heart and soul of Cacerías Ibéricas. Angel is a passionate of hunting with exceptional knowledge about shooting partridges and is the person who manage everything inside the drives, beaters, loaders, secretaries, flagmen, etc. Cacerías Ibéricas is a family enterprise dedicated to organizing driven partridge shoots, and is widely considered the most important in the world, in terms of the quality of its services as well as the exclusivity of its clientele. Cacerías Ibéricas has built a reputation of arranging the finest shooting holidays. We aim to exceed your shooting expectations, we look forward to hearing from you. 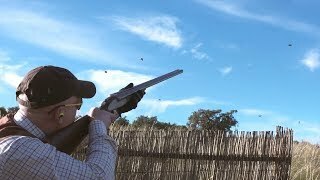 Game shooting experience at El Despeñadero: Cacerías Ibéricas offer all kind of different drives where we have a wide selection of shooting from the most hectic and traditional Spanish style to the highest bird’s English style of shooting which have been tested the mettle of history’s big shots. The topography of El Despeñadero with olive groves, forest and sowing’s lands as well as deep ravines from which we drive extremely high shoots produces a big variety of drives what presents a great challenge ensuring a top partridge shooting quality, our partridge presents an impressive fast, courageous and high flight. Click here for quick link country guide. Born in 1989 in Toledo, Spain. With a double degree in Business and Marketing has raised in Toledo and Madrid studying in Esic Business and Marketing School (with a break living in London). He has grown up with the shooting business and working all his life with his father in Cacerías Ibéricas. Actually focused and totally dedicated to the European market. What are the fishing/hunting seasons in Castille-la mancha, Spain? - All guns shooting must carry a current valid Spanish shooting license and insurance. - Each partridge day has been priced to a line of 8 guns. - Our offer is based in all included (accommodation, transfer, shooting, licenses, etc) except tips. - For peg confirmation is needed a 30% of deposit payment. 70% left will be paid before the shoot starts. - Payment must be in Euros - Your pegs will only be fully confirmed once payment is received. The accommodation we offer is also exceptional; we have some of the best hotels in Toledo, the imperial city”, with amazing views to El Valle and river Tajo. We offer accommodation for 16 guests, all spacious suit rooms, outside facing, all of which feature unique and original decoration that warranties the maximum comfort. Click here to view, choose and book the accomodation. by car or public transport to El Despeñadero. Congratulations to both Dario's. Excellent days shooting , plenty of challenging and very fast birds. Very well managed through the day with first class hospitality throughout the day - top class and tremendous value. Can't wait for more. February comes soon please!! Very serious birds as always and no words for your fantastic hospitality. One more time a big pleasure to shoot at El Despeñadero. This is our first time shooting at El Despeñadero. We did two days in a row and have to say the shoot was excellent, far exceeding my expectations. Thank you boys for your excellent hospitality. Looking forward joinning you next season. Honestly in my top 5 of shoots. Congrats for your amazing work and your fabulous team. Fabulous shoot and hosts with some extremely difficult partridges, highly recommended. What an amazing cuople of days last year as always. After 6 seasons shooting with Vallano's family is with fast one of the best shoots we have ever been. Awesome hospitality, fantastic food, ALL kind of drinks and stunning, stunning birds. Reviewing multiple visits What a days! Great hospitality, generosity, company and superb birds! Many thanks for everything to both Darío’s. Loving your old Range Rovers! See you in a very near future. I had the pleasure of shooting with Darío Vallano and his team this season again. They provided some very challenging birds, superb elevenses and the best hospitality I have ever seen. Very much looking forward see you in Spain soon! Spanish Patridge Shooting. We offer more than 20 different drives where we have a wide selection of shooting with some of the most challenging birds. First class accommodation. Date available for single guns or full teams. Get in contact for more info. Please get in contact for availability and more details.